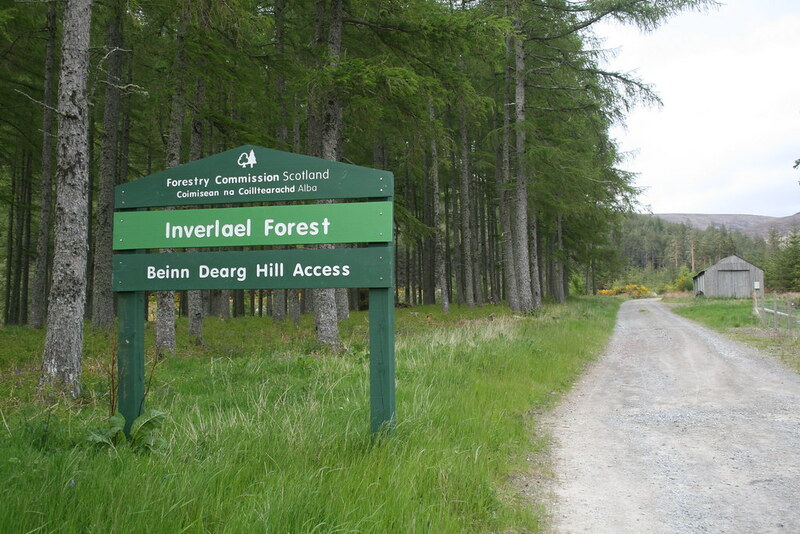 I kipped in the car the night before this walk at the Forestry Commission car park just to the west of the start point. The day before I had climbed the two most westerly Fannichs. Today I wanted the option of completing the remaining seven. But I was not sure whether my fitness would be up to this. So the southerly approach was the logical one for this if I felt up to all seven. The weather was less promising. All of the tops were covered. The forecast was not promising in terms of views, though there was likely to be little rain and the wind was supposed to be moderate. Still when one has come so far…. As you emerge from the forest you are into the open glen. The scenery becomes wilder, or would do perhaps but for the ever present pipe line to your right and, eventually, the works associated with the dam at the end of Loch Fannich. There was a short sharp rise to a bridge by the house of Aultdearg with its crumpled Saltire hanging limply from a pole. Then came a long flat and speedy section along the valley bottom adjacent to the river again. The road deteriorated a little where it split with a turn to the left at a bridge to go to the base of the dam. It then ceased to be tarmaced at a second junction 500 yards further along at a sign announcing the Fannich Estate. But the way remained good. 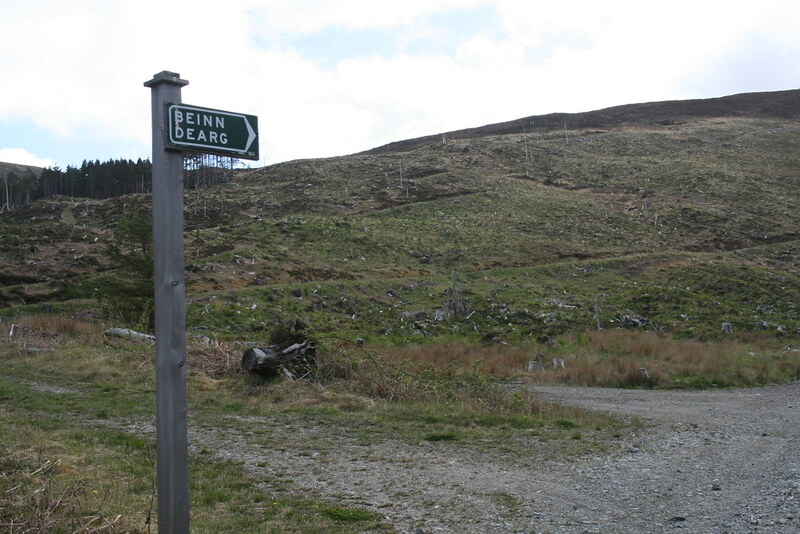 The road reverts to tarmac once it rounds the southern spur of An Coileachan ¾ mile or so beyond some quarry workings. From there it was an easy ride. I stopped at what looked to be a relatively new deer fence with attendant cattle/deer grid at the Alltan Caoruinn. I stashed my bike under the bridge there and headed north on a line diverging from the fence. It had taken me almost an hour to reach this point almost a mile short of the Lodge and its attendant buildings. The ground was remarkably dry, almost crunchy under foot. It only took me about 20 minutes to reach cloud level. From there it was a straightforward plod up to the summit. I reached it at 9.30am – so 2 hours 50 minutes from leaving the car. I pondered now which route to take next. 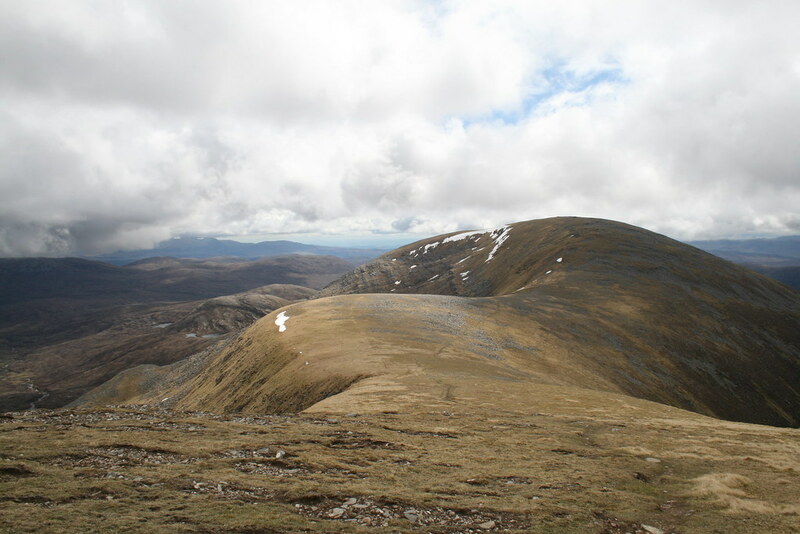 Still uncertain of my fitness I wondered whether an option might be to miss out Beinn Liath Mhor Fannaich and to do the other four Munros,. This would leave BLMF as an easy day at some other time. 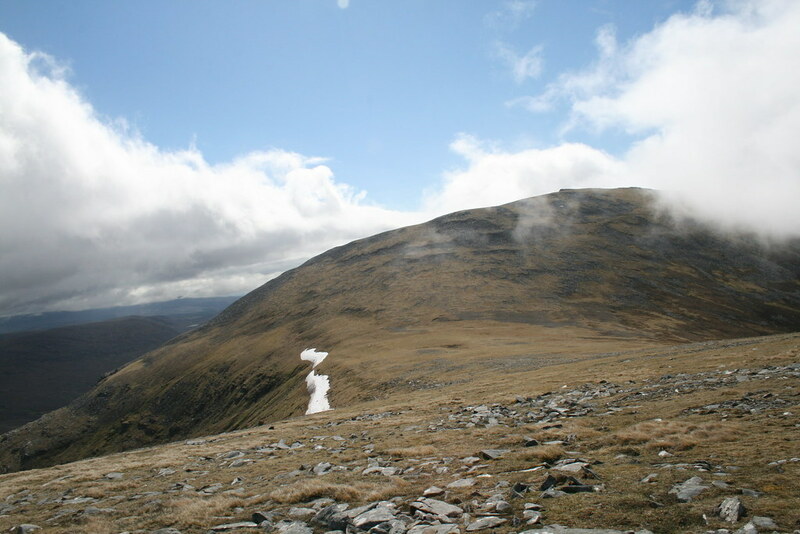 Alternatively I could do BLMF and Sgurr Mor and return to Fannich Lodge via the stalker’s path that leads down the south ridge of Meall Gorm – but that would mean missing a wanted top, Carn na Criche. From the summit of Meall Gorm a stalker’s path took me down to the next col, passed along the flanks of Creachan Rairigidh and on up to the top of Meall nan Peitheirean. The cloud had lifted on this section. Above I could make out a small figure making his/her way up Sgurr Mor having come from the way I had now determined to go, i.e. BLMF. 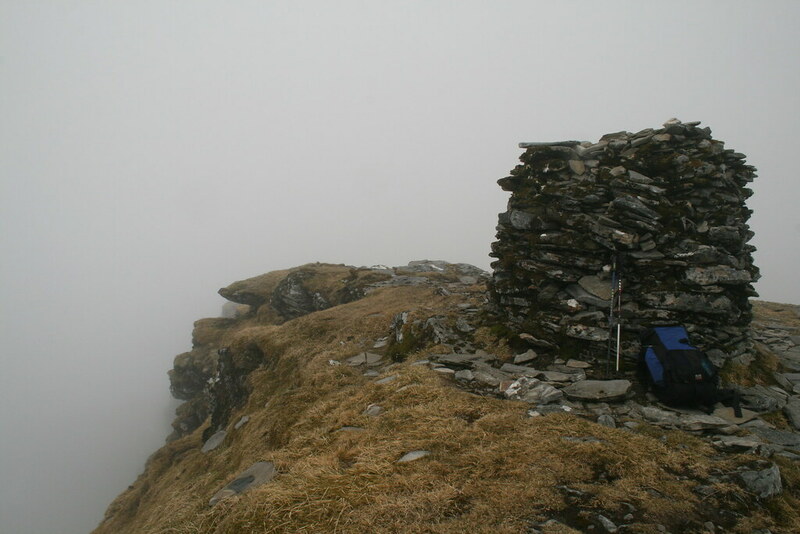 There is a small stone shelter on the lower slopes of Sgurr Mor that was soon passed. The path continues avoiding the next bump to the south (briefly disappearing before reappearing after 200 yards or so, with an alternative over the top of the bump) and descends to the bealach below BLMF. Here a stalker’s path trends up to the left, created by the casting aside of rocks, at times passing through a knee high canyon. 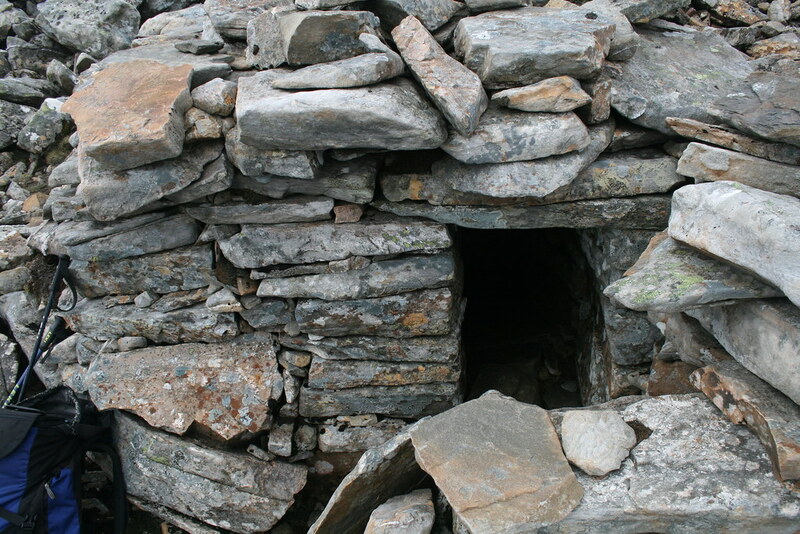 It is beautifully graded and takes you round to the north ridge where a large cairn is found. That guides you up the final rocky blocks to the summit. By the time I was back at the col, the rain was easing off and I could see down either side of the ridge between swathes of cloud. The cloud lifted as I approached the final rise to Sgurr Mor. Passing the stone shelter again I took some photos of it. 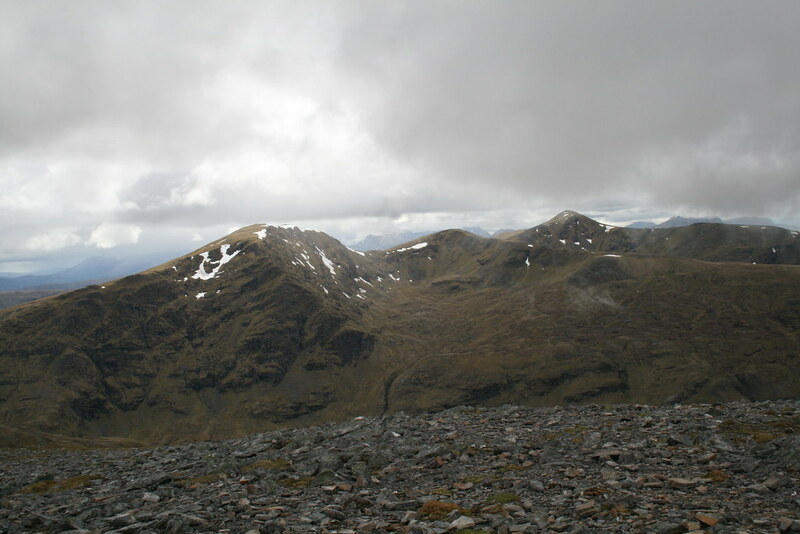 At this point Sgurr Mor was clear with a vortex of cloud swirling by its north-east face. It is a good pull up. There is a path but most of the way up it was covered by the remnant of a cornice. Only towards the top did it re-appear. 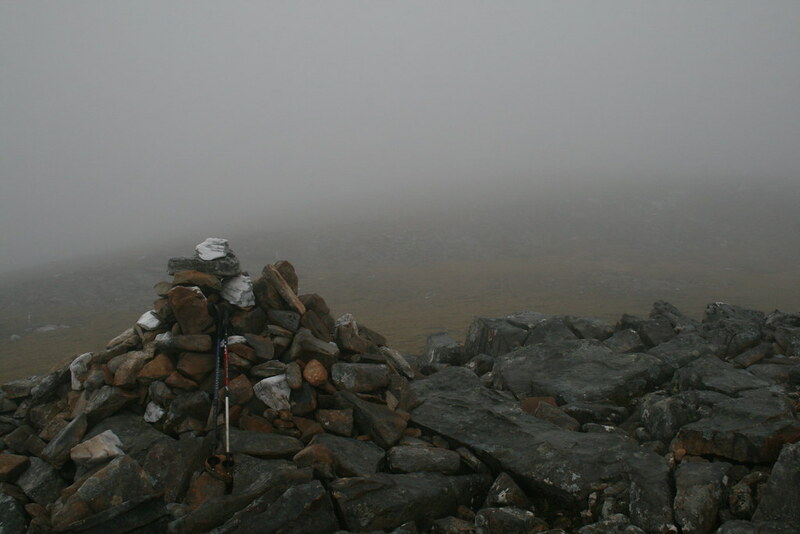 Of course, as I reached the summit, the cloud come down again but not before I had glimpsed down the precipitous north-east face. After a good long stop I followed them north-westwards. The drop towards Carn na Criche is quite deep. But there is a path and the angle up to the top was easy. I had missed Carn na Criche on my previous visits to the Fannichs. Now I was able to “collect” it – just three more tops to do now. It was clear and, turning to look at Sgurr Mor, I saw that it was clear as well. C’est la vie. 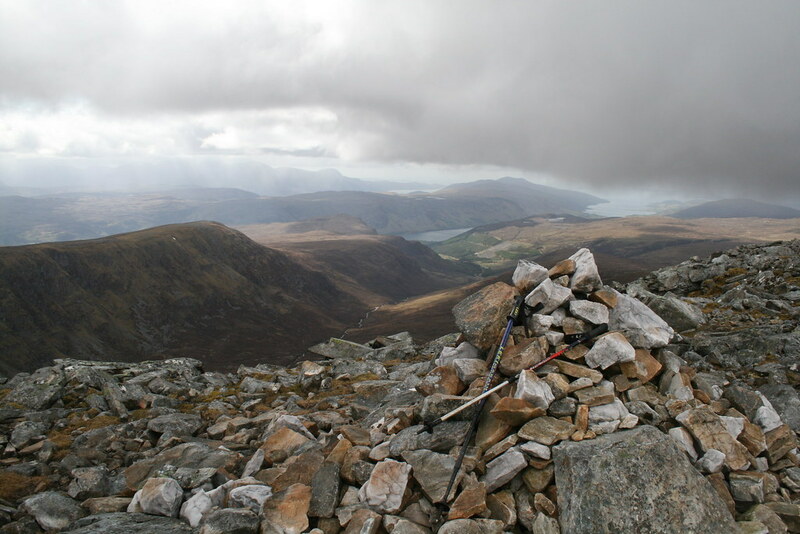 There is a fine view from Carn na Criche up Sgurr nan Clach Geala’s north-east ridge and, if you look for it, Loch a’Mhadaidh. So now there was a diversion out to Meall a’Chrasgaidh. Stony ground led down to the broad wet col. The ground was sufficiently stony to hop from stone to stone where needed to avoid the risk of wet feet. This area could have been somewhat wetter I imagine. There was then a worn path heading straight up the slopes ahead. Looking to my left An Teallach was clear. So I thought that I would have good views of it at the top. But by the time I reached the top, only the second clear top I had, An Teallach had been blanketed. 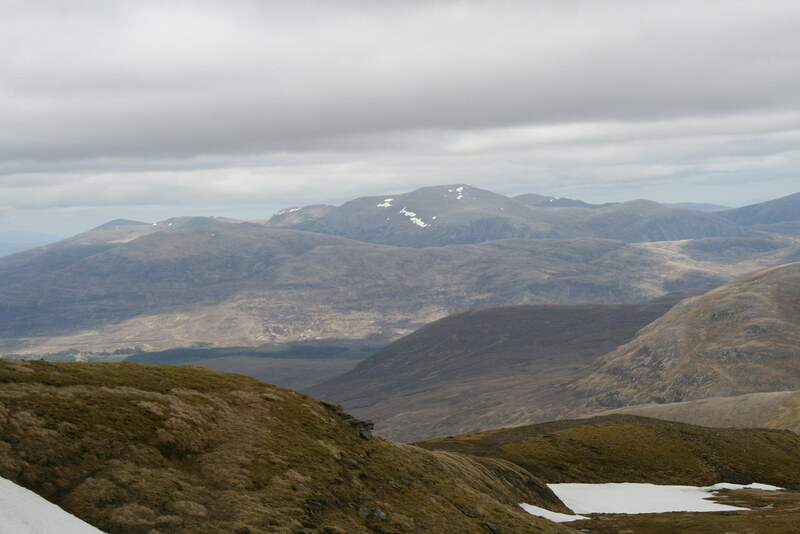 Nonetheless the views to the two western Fannichs that I had been on the previous day, to Sgurr nan Clach Geala (also clear now) and north-east to the Beinn Dearg group were nice. Slioch was also maintained a brooding presence. 55 minutes to here from Sgurr Mor. The descent back to the wet col was swift and was followed by a short steeper pull back to the deer grazings of Am Biachdaich. I made my way first towards an obvious erratic and then just to the west of the lochan that nestles at the foot of Sgurr nan Clach Geala’s north-east ridge. Here I picked up a path of sorts and also the cloud again. 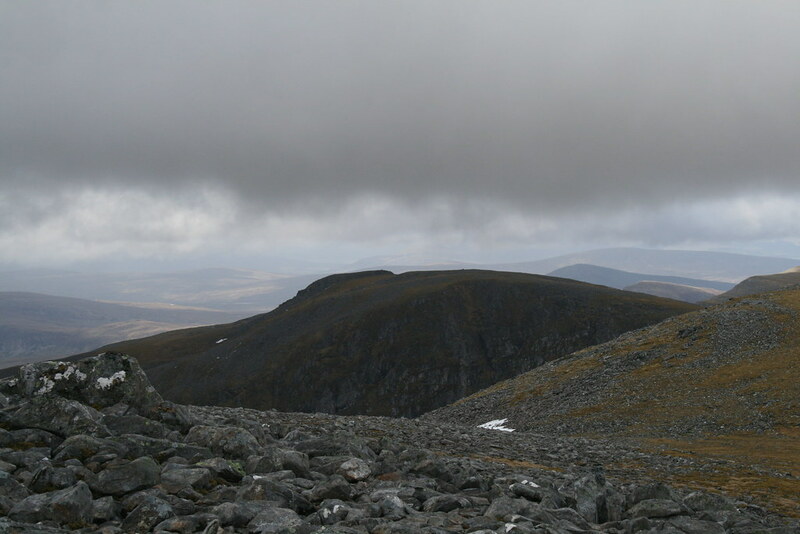 The north-east ridge is probably the narrowest in the Fannichs, but in the cloud I could only sense the exposure. Old patches of snow plunged down to my left into grey depths. I passed a couple of rocky knolls and a father and son duo descending – father not impressed with the conditions. There was now drizzle in the air. 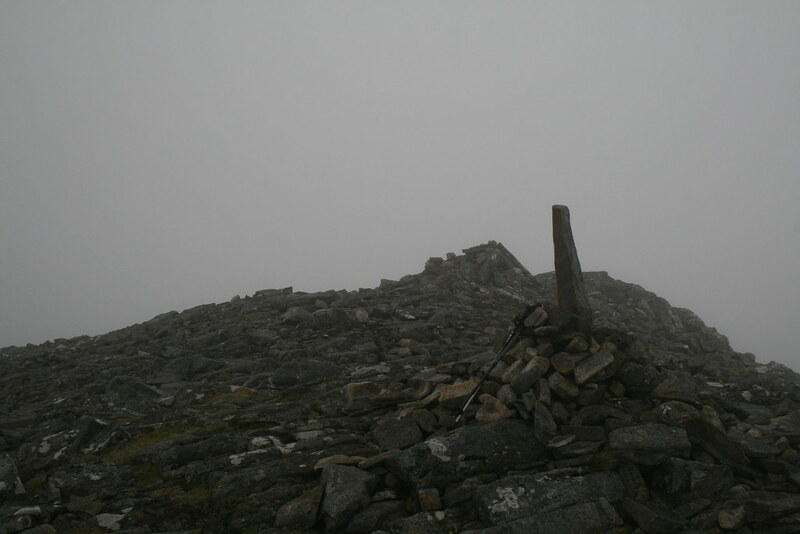 It is a long haul up, 800 feet or so from the wet col to the shattered trig point and the cairn a little further beyond. My legs were now starting to feel the effects of a long day. I walked straight by the trig and cairn, there was no point in stopping, and along the crescent shaped summit ridge – 4.25pm. A path continues down the north ridge. I stopped to talk to a guy who was making his way up. He had just 10 more Munros to do to compleat. The cloud had lifted once more by now. Sgurr nan Each looked quite small below. I could see down to Loch Fannich – it looked some way off and I knew that I would have to get there! At the bealach I stopped and sat on a rock to gird my loins and psyche myself up for the final ascent of the day. Oh and to stuff my face with jelly babies. Suitably sugared up, the zig zaggy ridge to Sgurr nan Each passed without incident. Reaching the top I had a third clear summit. It was 5.15pm. A brief shower passed over. Loch Fannich looked no closer. My route of the day formed the skyline to the east and north (though of course BLMF and Ma’C could not be seen). Fionn Bheinn was still stuck with a cloud cap. Slioch was there glowering away with a backdrop of black cloud. The Torridon giants were somewhat obscured by the gloom. The Strathfarrar 4 were prominent. Having refuelled I set off down the south ridge. 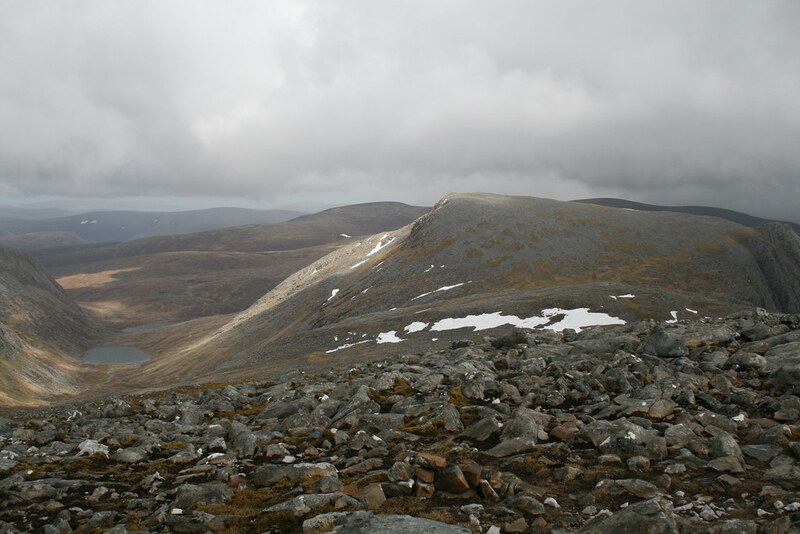 From the col with Sgurr a’Chadha Dheirg (point 866 on the 1:50000 OS) it is possible to descend east to the moors of the Allt a’Choire Mhoire where there looked to be a track running around the foot of Druim Reidh. 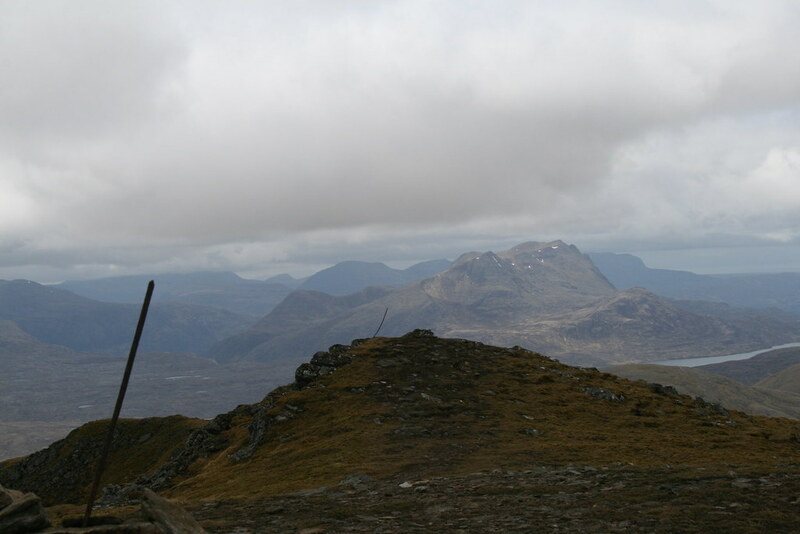 Alternatively you can climb over or flank Sgurr a’Chadha Dheirg. I took this last option as I could not be bothered to climb the 200 feet over this top. The slopes were not too bad. 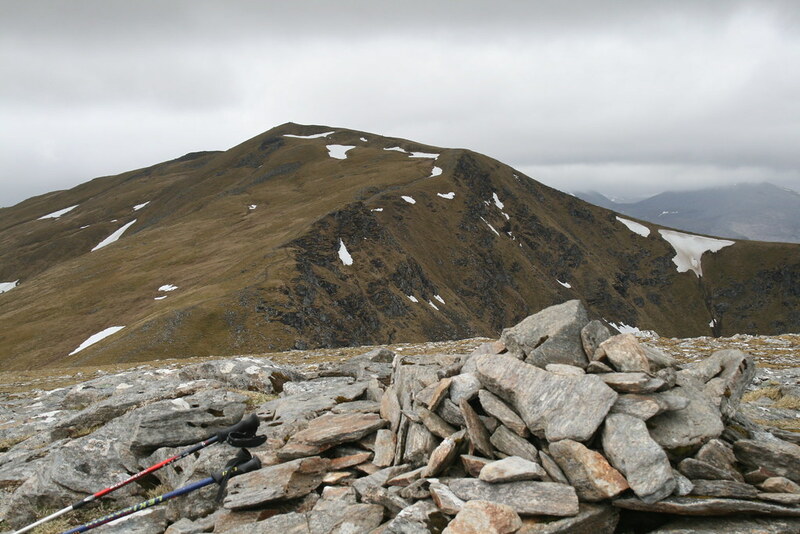 However it seemed to take an age to drop down to the peat hags on the col with Torran Ruadh. I even had to take a rest at one point. I finished the last of the two litres of fluid I was carrying. Although it was not a warm day, there was a steady light breeze that was dehydrating. From there I made my way direct to the track by Loch Fannich dropping down to the track via a break in the trees clearly shown on the map at NH183689. From here it was 2 miles to Fannich Lodge. It was then a further ¾ mile or so to where I had dumped my bike. I cannot say that this was the most favourite part of the day. The track through the forest being particularly oppressive. But at least I was able to obtain some more water and there were no midges. And the Lodge looks a fine building, the kennelled dogs to the rear barking as I plodded by. The bike was retrieved. I then had the most wonderful ride out speeding along with the wind at my back, my sore feet forgotten. On a couple of occasions deer stood to watch wondering what this flying object was before, at the last moment, sensing danger perhaps, prancing off out of harm’s way. The scent of pine filled my nose as I passed through the forest near the end – wonderful. I was back at my car at 8.40pm, exactly fourteen hours after setting off. This is a great walk and a good challenge. 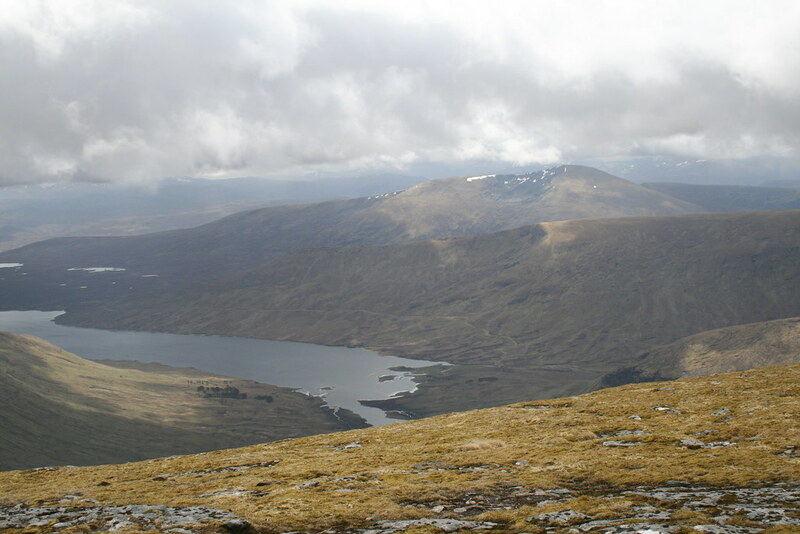 Of course, it can be extended to include the western two Fannichs to make the challenge harder, though that probably means finishing at Loch a’Bhroin. After the previous day’s exertions I was not up for a mega day. So it was a more leisurely start at 9am. The start point was that suggested by the WH route and I was soon walking down the track towards Loch a’Bhroain. Again the forecast was not that promising according to MWIS with an early 70% chance of cloud free summits dropping to 20% during the afternoon and drizzly rain becoming more extensive. In less than 20 minutes I was at the bridge over the outflow to the Loch. The public footpath has been diverted through a short section of woodland to accommodate the prospective rebuilding of the lodge on the Loch. There is a brief notice about the plans at the beginning of the track. I followed a woman walking her three dogs and another solo walker who was tackling the three Munros to the east. I was going to continue along the path that eventually leads over to Loch Fannich up to the watershed before turning north-west up the east ridge of Sgurr Breac. One disadvantage of this route might be the difficulty of crossing the river if it is in spate conditions. However, there is a path that continues up its left bank if a crossing proves difficult. I know this because in my indolence I carried on up the left bank having missed that crossing. The ground did become a little boggy higher up where the skeletal remains of buildings can be found, but the river crossing here was simple enough and I worked my way across the “proper” path about one kilometre short of where the map shows the path crossing the river again. This is at a point just short of a small waterfall. 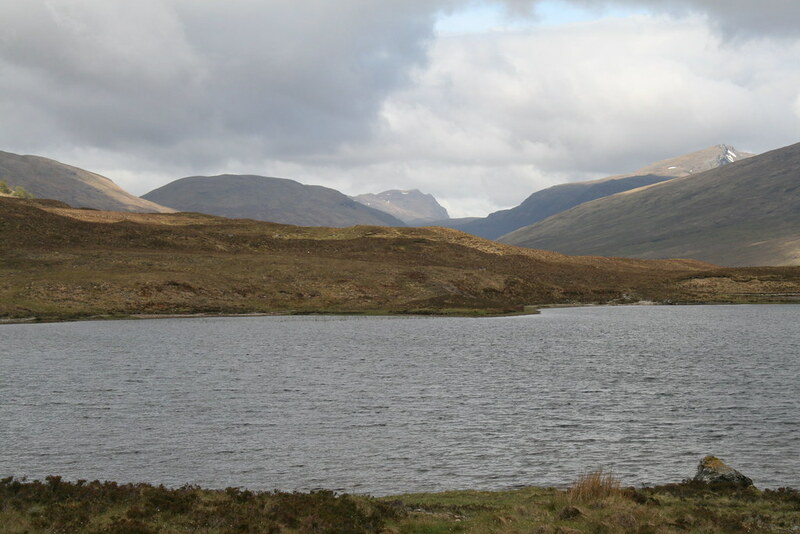 It is a well-engineered path and its deposits you at the watershed with a view down to upper Loch Fannich. It was about two hours to this point, including a short stop for food and water. 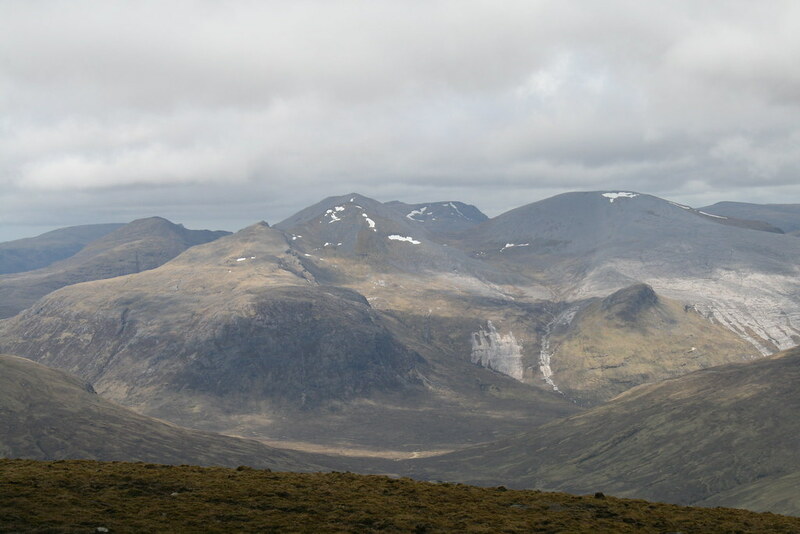 I found the glen quite pleasing with Sgurr nan Clach Geala rearing up to the left and some cliffs on Sgurr Breac to the right. 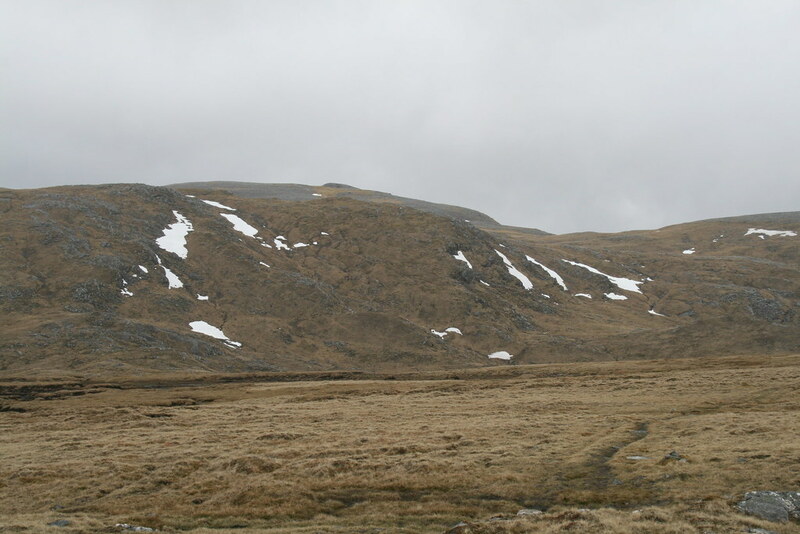 I saw one figure up on the lower slopes of Meall a’Chrasgaidh slowly making his way up. At the watershed a small cairn marks the way to the right up some initially wet ground. But this was soon passed. A strong path then leads most of the way up. 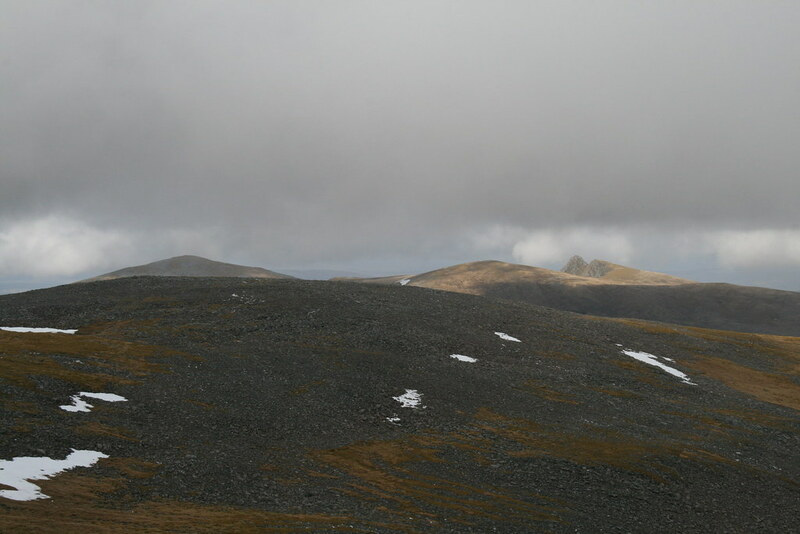 The top of Fionn Bheinn was covered and grey clouds were massing to the south and west. My hopes for a clear summit seemed to be foiled as cloud descended when I was still a little way off. Soon afterwards I met a group of three who had had an early start and were doing my route in reverse. We had a brief word. 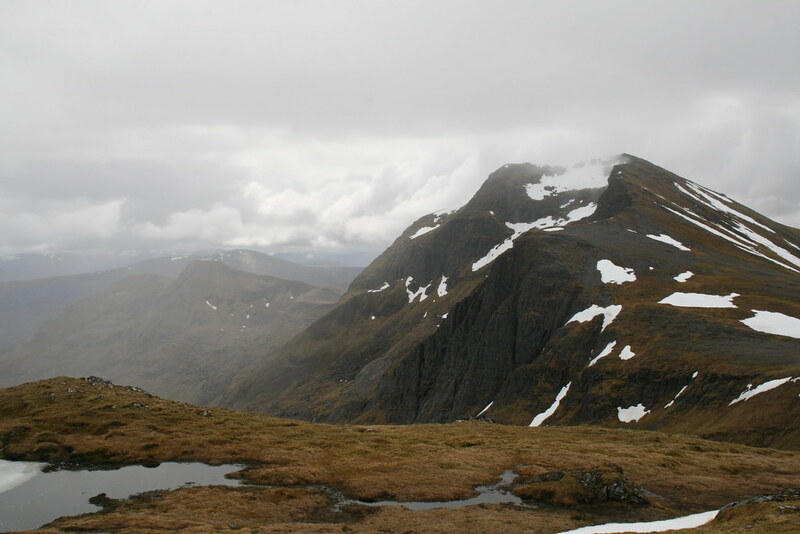 The cloud had been down on Sgurr Breac when they were there. I continued and as I ascended so the cloud rose too. In just under three hours I was at the top. Fionn Bheinn was now clear. 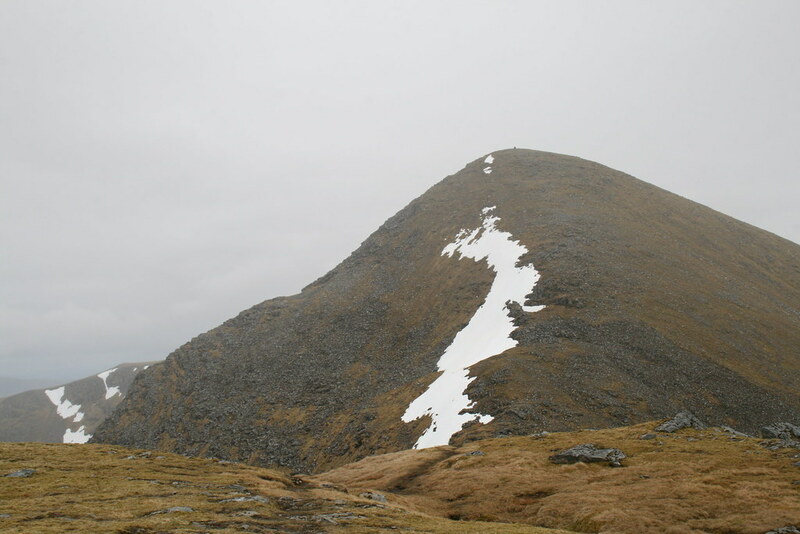 Sgurr nan Clach Geala opposite stood proud. Much further to the west there was lower cloud and evidence of rain. 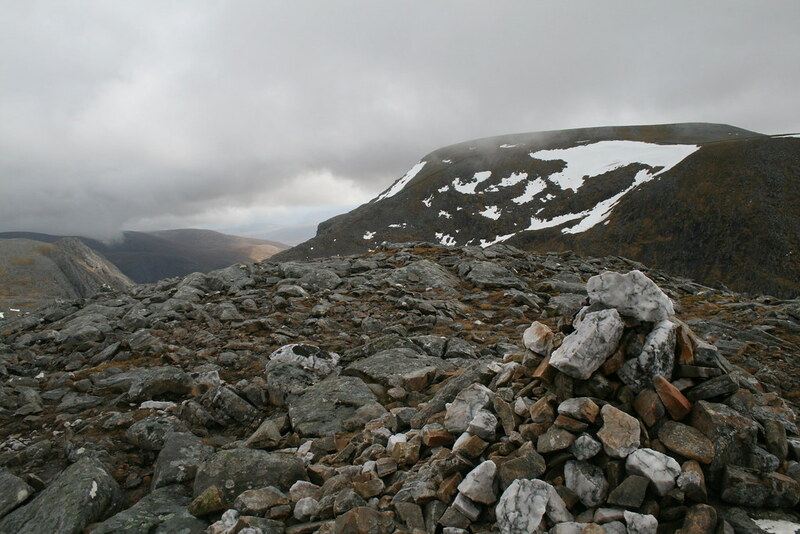 It was windier than forecast so I did not stay long and I wandered over to the second cairn which marks the start of the short but steep west ridge. From the bealach before the top of Toman Coinnich I contoured around the southern slopes of that top. An incipient path can be followed so far before it disappears. If you follow it, I suggest the only height that is then lost is that to avoid a small section of rocky outcrops. The next bealach was then easily reached. Again a strong path takes you up the 600ft of ascent to the summit of A’Chailleach. 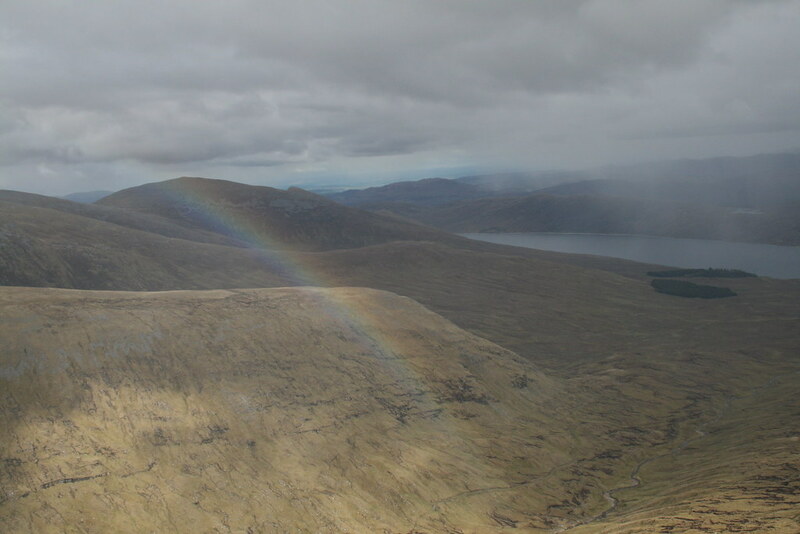 Although there was less blue sky now, the views to Slioch, Fisherfield, Beinn Dearg and the rest of the Fannichs were good. 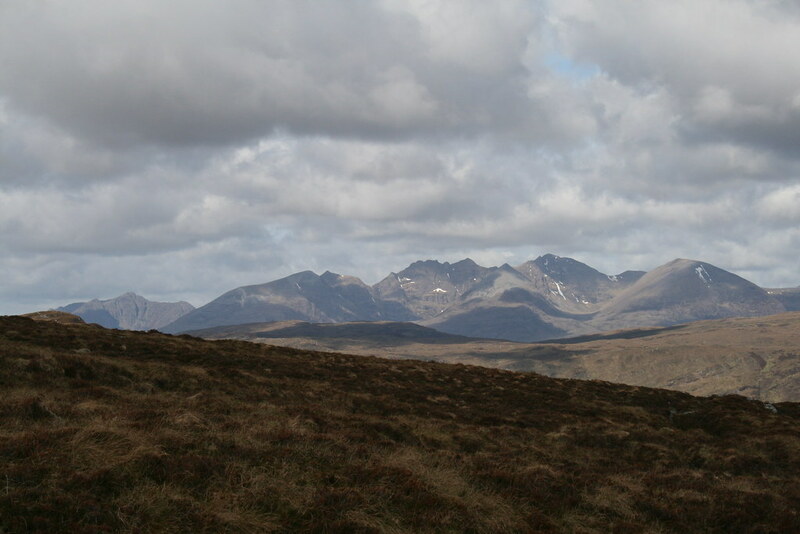 The higher Assynt hills to the north-west were blanketed in cloud though and An Teallach could not shake off its cover. 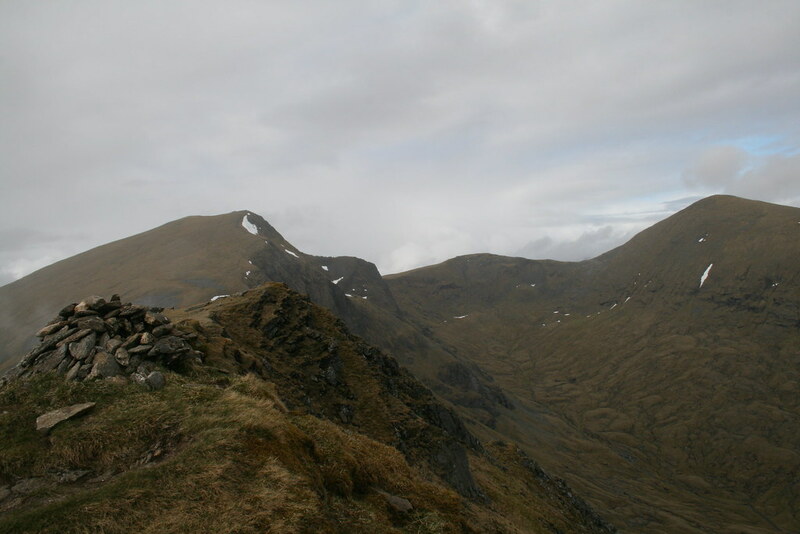 It had taken me about 45 minutes to walk between the two Munros. I sat a few feet down from the cairn to keep the worst of the wind off me and had a late lunch – grateful for the views and checking that none of the grey stuff was going to come my way. I had a good half hour there taking it all in. I still seemed to have these two Munros to myself. Time to go then. My way off involved returning to the summit of Toman Coinnich and descending the route of the WH ascent along Druim Reidh. This is a great way down. 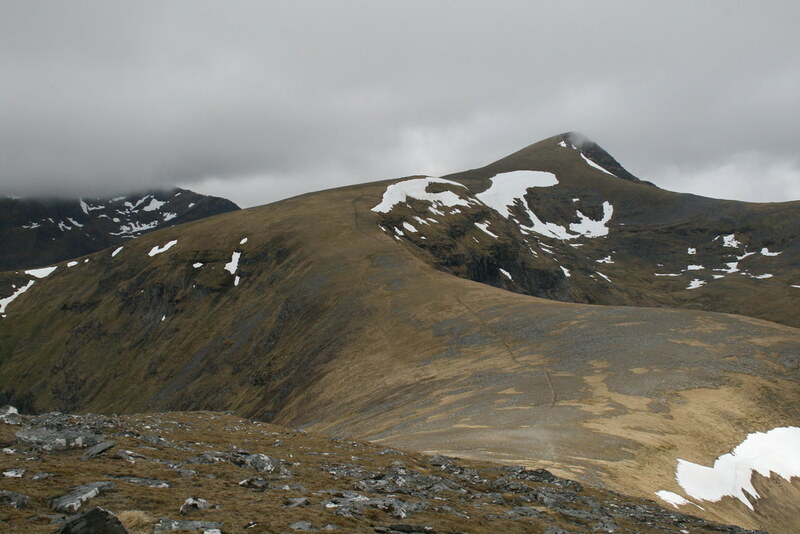 The ridge is mainly easy angled and the ground underfoot is kind until the very end and interest is maintained by the good views north to Beinn Dearg and the north-west. I spied a few others descending from Sgurr Breac. 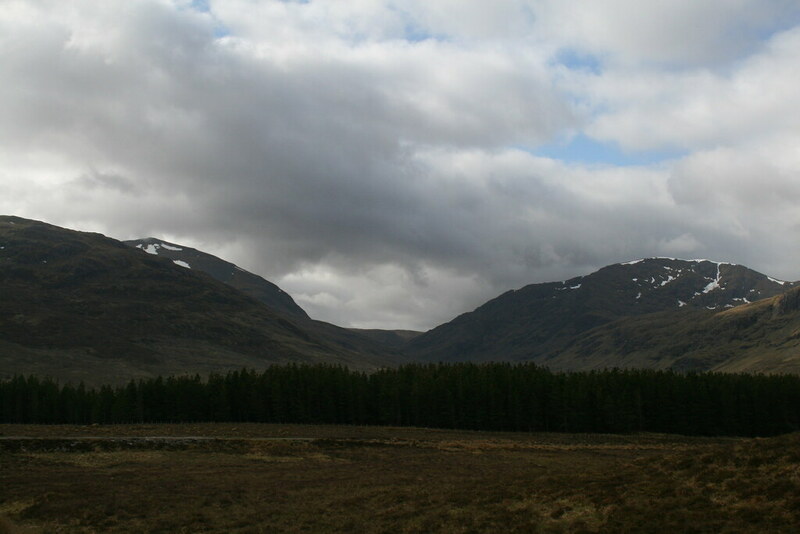 Cloud started to brush the top of the two Munros. I have used the way off Sron na Goibhre. I remember it as being, ankle turning and wet. The new planting by Loch a’Bhroain does not help though, as the WH route description states, there are stiles over the deer fence protecting the new plantings. 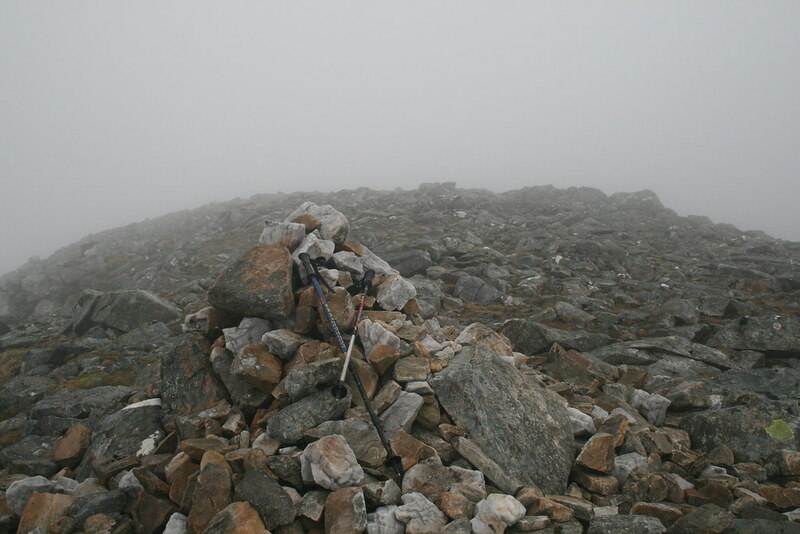 At the end of Druim Reidh, there is a steep peaty path that avoids the crags and gives a quick loss of height. It continues avoiding also much of the wet ground until right at the end before the Loch Fannich path is joined. Once on the path I was back at the bridge in a few minutes. I stopped there and looked along the Loch up to distant Slioch and the Fisherfield hills, their heads just covered with clouds. The water slipped quietly beneath me as I contemplated how lucky I had been with the weather. I was back at the car before 4pm after a leisurely round of 6¾ hours. Seana Bhraigh, of course, has the reputation of being one of the more remote Munros. I had been up it once before, many years ago in the years BC*. 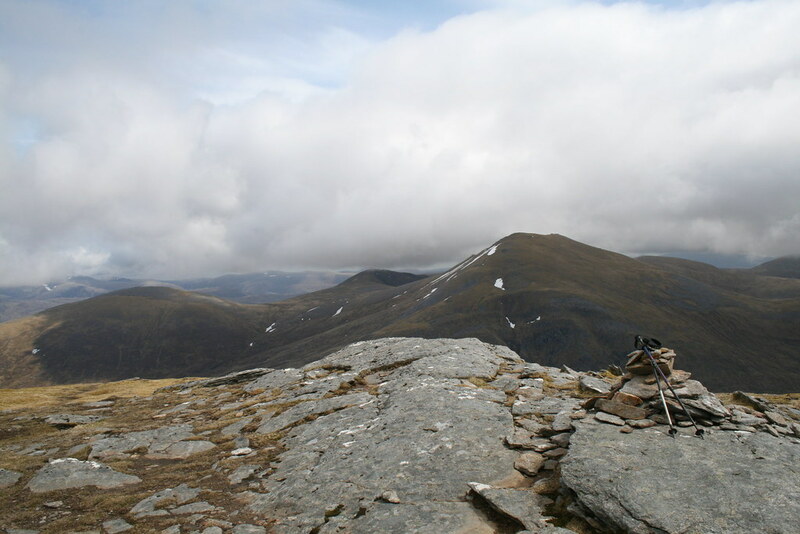 Then it was part of a two day trip taking in the Beinn Dearg hills and Am Faocagach. On that occasion I had found a delightful camp site by Loch Prille beneath the dark cliffs of Cona Mheall before summiting Am Faocagach by 7am and then resorting to the Aultguish Inn for a second and more substantial breakfast. I imagine the best approach to Seana Bhraigh to be that via Corriemulzie Lodge. 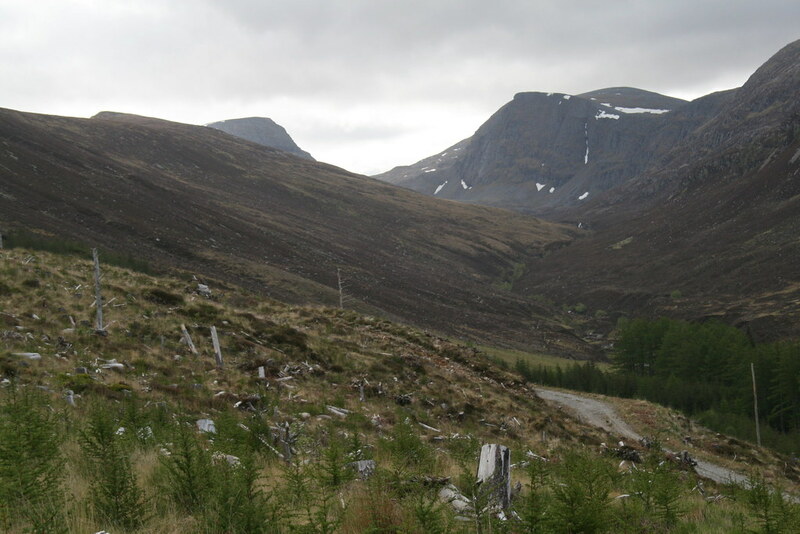 The magnificent north east coire is best seen from that direction. 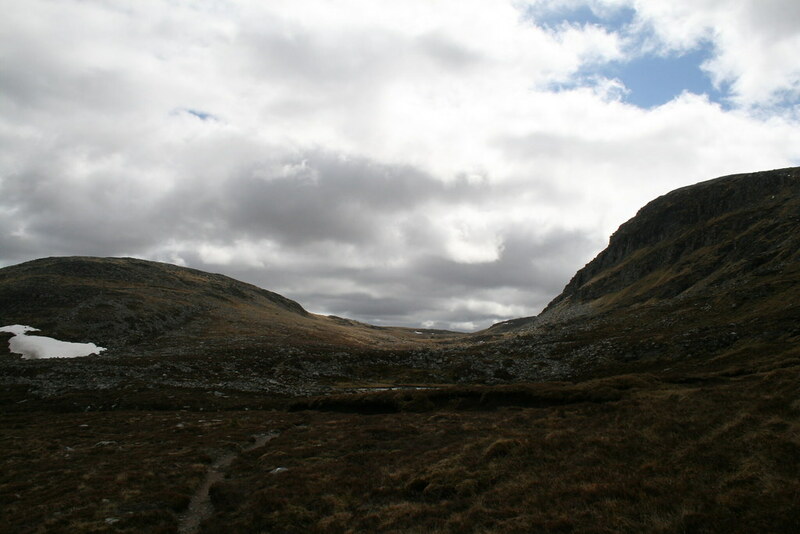 That remains one of my objectives – to stay also in the bothy by Loch a’Choire Mhoir and to ascend via the Creag an Duine ridge. On this occasion I wanted also to climb Eididh nan Clach Geala and Meall nan Ceapraichean. So I took the route from the west at Inverlael. I was at the car park by 8am, a little later than planned. There were already two cars and a campervan there. At one of the cars a group of three were readying themselves, planning to do Beinn Dearg and then to see how both they and the weather were doing before deciding what to do then. 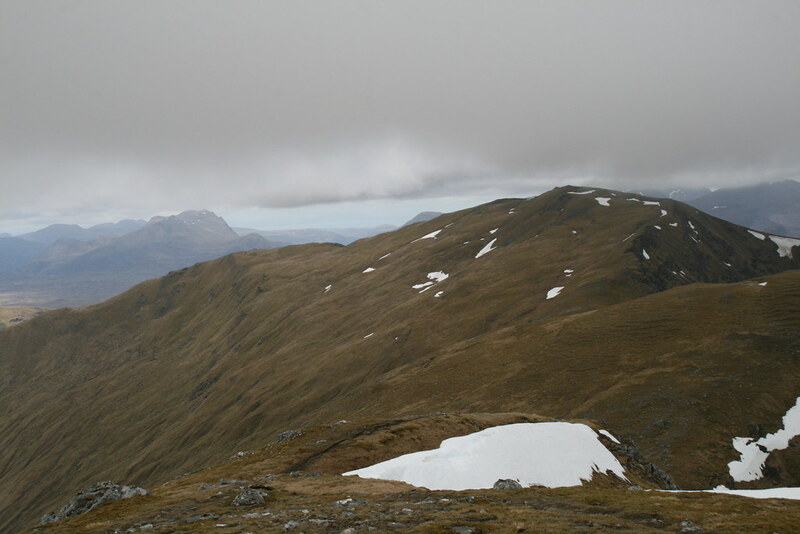 The forecast was not promising with just a 30% chance of cloud free Munros according to MWIS and drizzly rain that would clear during the afternoon. The clouds might also lift by the end of the day. Well I was looking for a navigational challenge! What was in the sky bore no relationship to the forecast. White fluffy clouds hung in the sky, above the tops. Loch Broom reflected the blue. There was also no sign of rain. No navigation difficulties, and yippee! I set off up the forestry track by 8.20pm after sorting myself out. I was soon through the remnant of forest. I remembered that on the last occasion having some difficulty finding the turn off down over the river, but now both the extensive felling and a helpful sign ensures that no mistake is made. I had toyed with leaving Seana Bhraigh to last with the weather supposedly improving during the day, but given what I was seeing in the sky I decided to go there first. 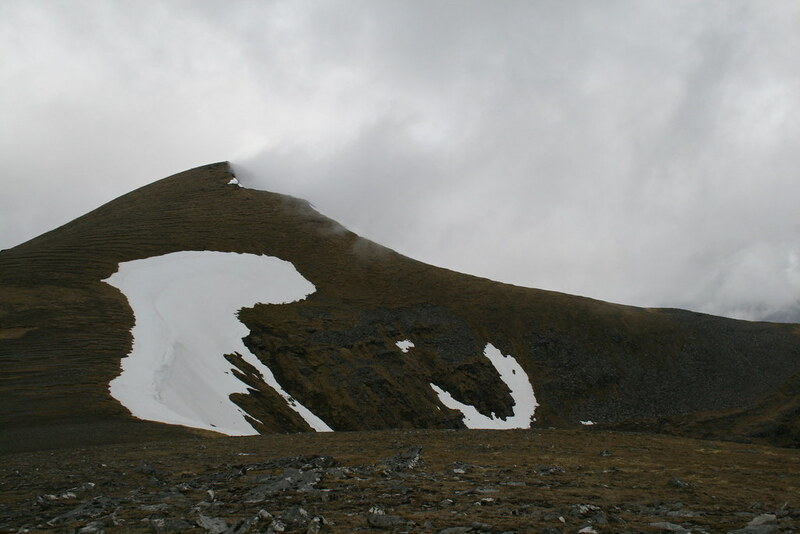 So I ignored the second sign pointing the way to Beinn Dearg and took to the stalker’s path that shows itself quite obviously zigzagging its way steeply up the slope ahead. 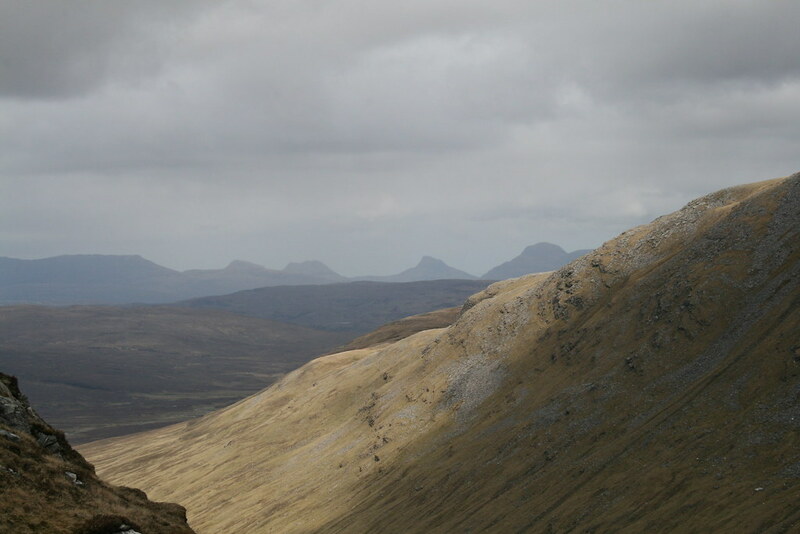 I looked below and could see the three I had met at the car park starting their way towards Beinn Dearg. For me the former edge of the forest was soon reached with a gate in the fence. The steepness then relented a little and a long moorland crossing started. 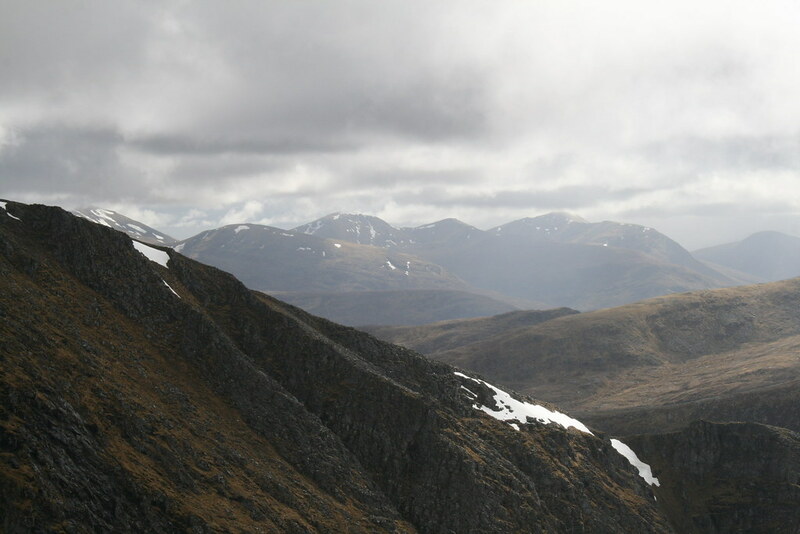 The cliffs of Beinn Dearg had been in view for a while but now, behind, views to An Teallach, Fisherfield and parts of the Fannaichs were beginning to open up. I took the opportunity of a quick breather to take in the views. The path ahead was clear and, for me, contrary to reports I have read the ground was remarkably dry. The river crossing at NH226853 was straightforward and the feeling of remoteness slowly grows even with the strong path. 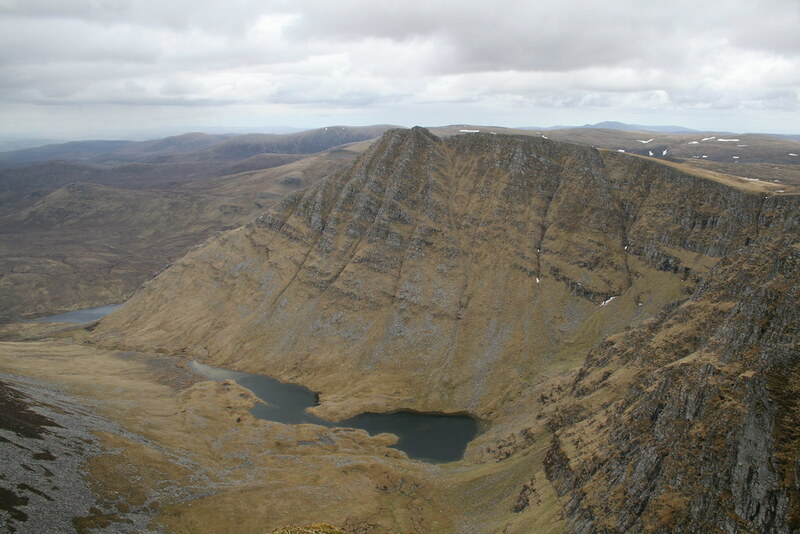 I swung into Coire an Lochain Sgeirich with its chain of lochans, crossing at the outflow of the first. 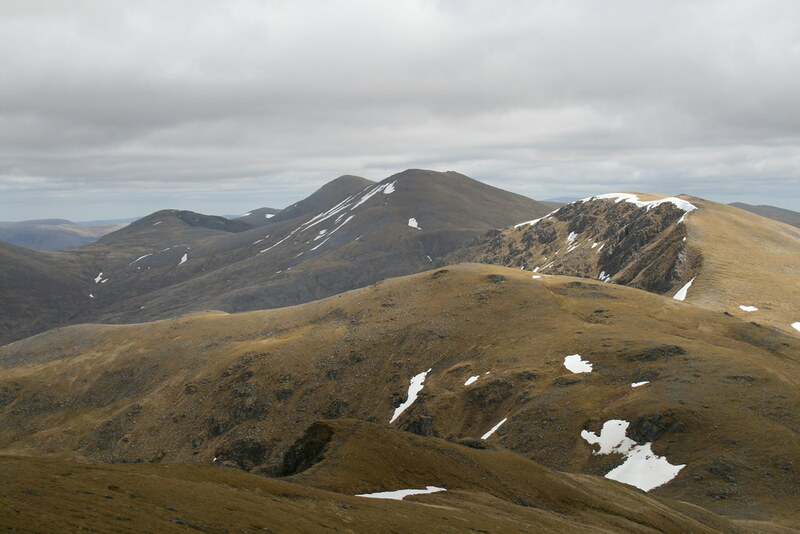 The path continues its gentle rise with cliffs to the right (south) and the swelling of Meall Glac an Ruighe to the left. A line of cairns and small standing stones marks the continuation from a time before walkers’ boots had made the way so clear. My recollection from my previous visit was that these were the only guide and that there was no path to speak of on the ground – perhaps my recollection is faulty. Whatever, the path suddenly disappears and so begins the navigational challenge if the visibility is poor. Seana Bhraigh was not in sight because of the slightly higher ground ahead. I turned a bump ahead to the right (south east) and then made my way to the stream that feeds Loch a’ Chadha Dheirg. From there I thought I might follow the cliff top of Cadha Dheirg. But having passed the three lochs shown on the map I decided that there were too many ups and downs and took a bee line for the low point ahead. A path was picked up before the low point was reached which I followed. 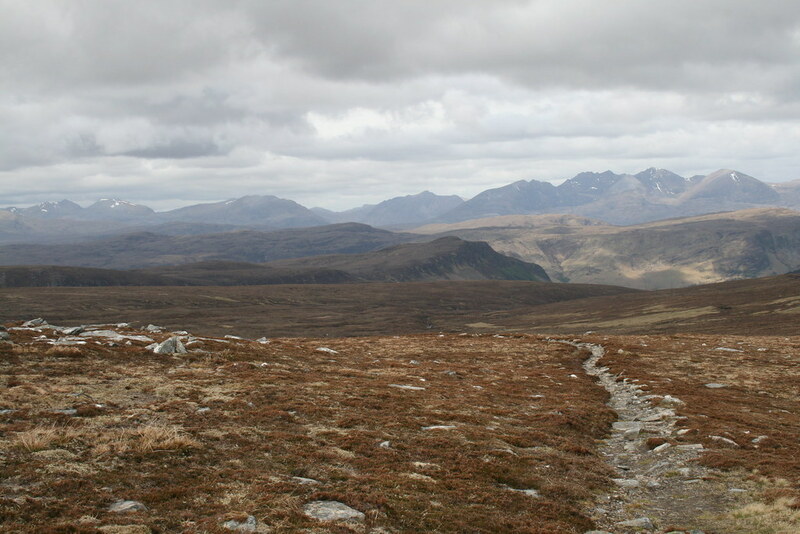 The view north west along Gleann a’Chadha Dheirg is a classic – looking along the serpentine river to the monoliths of the north west. That view was a little grey today. Showers were developing and veils of rain partly obscured the hills. 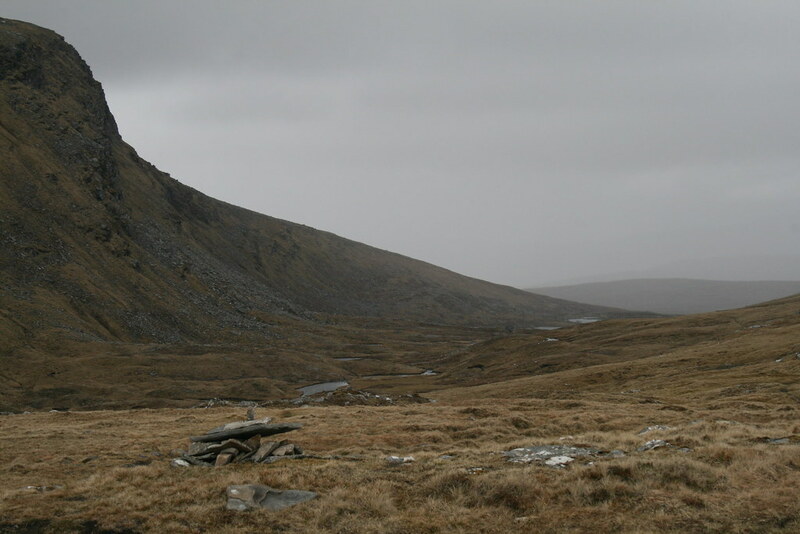 The peaty path continues a little way up the flank of Seana Bhraigh, but soon it exists more in the imagination. I took a rising traverse to the south west of point 906. The ground was relatively dry but I can imagine that in less clement conditions it could be quite a squelchy approach. The col came into view and with it a path. Smatterings of a path also came down from point 906. The final rise to the top passed without incident. This is a great viewpoint. Ben Hope was obscured and Conival and Ben More Assynt seemed to be being battered by rain. But everything from Ben Wyvis to Ben Klibreck to Cul Mor and little Stac Polly, Ben More Coigach, An Teallach, Fisherfield and the Fannaichs and of course Beinn Dearg and its satellites could be seen. 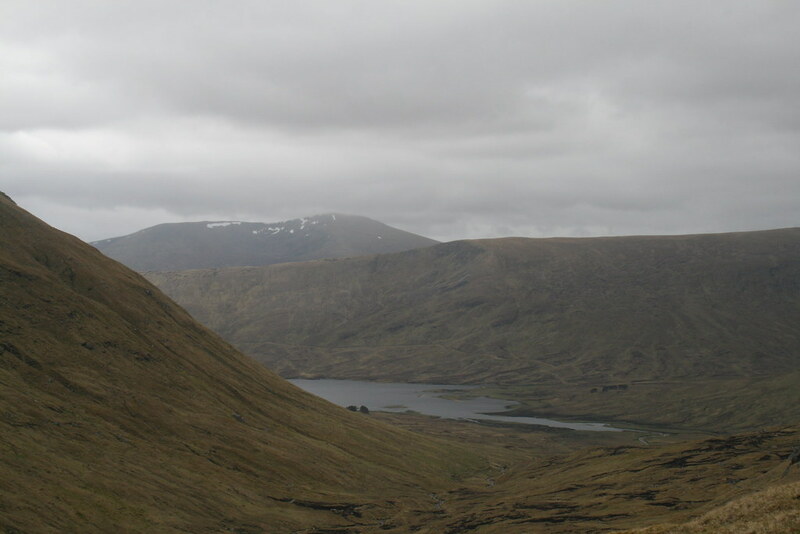 The weather was becoming grimmer and a shower passed a couple of miles to the north along Glen Achall. But all was well on Seana Bhraigh. 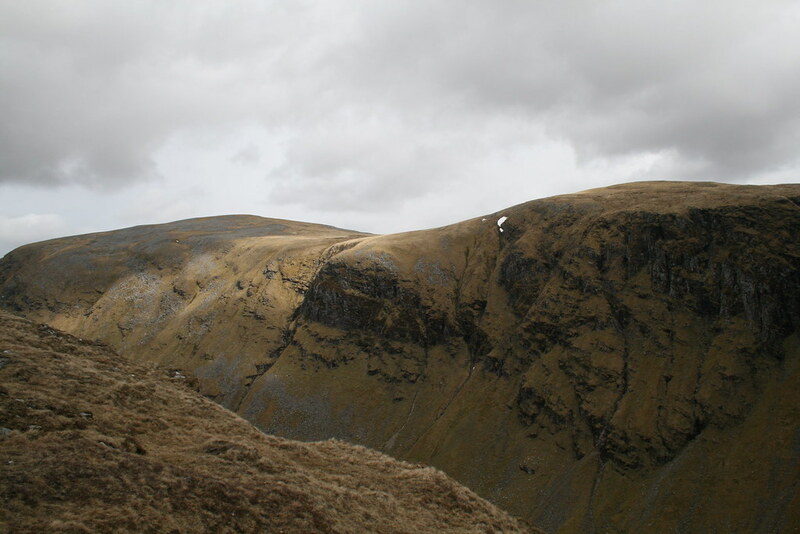 I wandered over to the top of the cliffs and looked at Creag an Duine across the void of the coire. 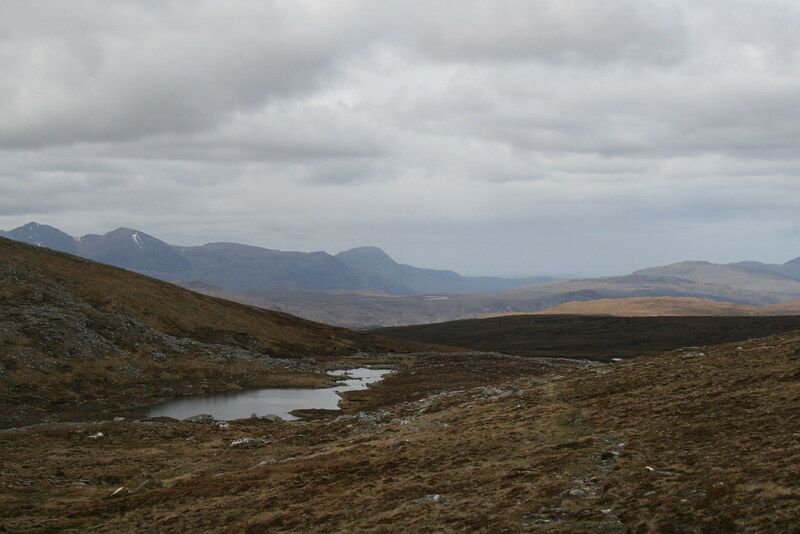 Way below were the lochans in the coire. I returned to the shelter for something to eat. It was 12.25. Having come so far, it was worthwhile staying a while – so I did. I was feeling fit and relaxed. I made a couple of calls to brag about where I was and the views – yes there is good mobile phone reception there! It was 1pm and time to go. So I retraced my steps around point 906. Creag an Duine would have to wait until my next visit. Almost back down at the head of Chadha Dheirg I met a second group of three (who had stayed in the bothy by Loch a’Choire Mhoir, scrambled up Creag an Duine and done a circuit over the two tops I was yet to do) plus a single guy who I later learned was DJAM of WH (see his report here). DJAM and I speculated whether we would get our remaining tops clear. It was definitely becoming gloomier and there were a few spots of rain in the air. On the return towards the outward path I kept to a lower line, but still aiming for the stream feeding Loch a’Chadha Dheirg. This felt to be a more satisfactory way. I then followed this stream up to its source between the two contour rings shown on the map and then on in a south westerly direction to intercept the path. It had now started to rain lightly, but persistently. 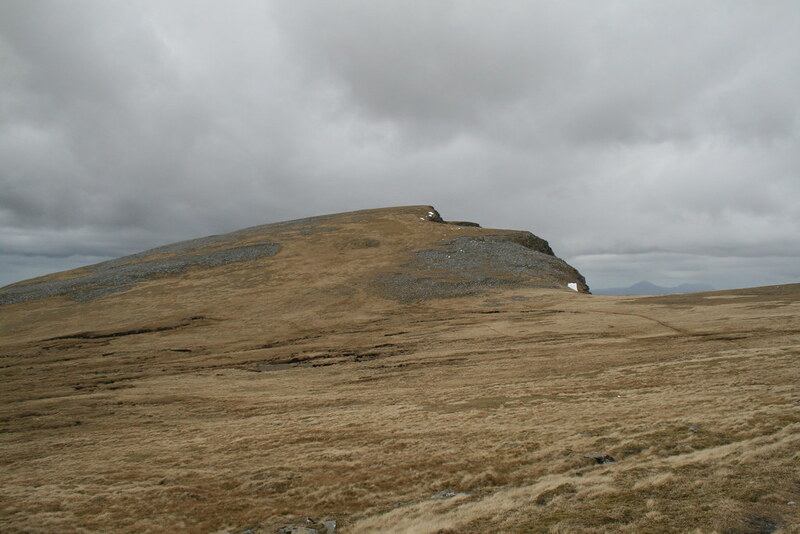 The top of the next objective, Eididh nan Clach Geala was now covered. I stopped for a quick bite and a look at the map to plan the way ahead. 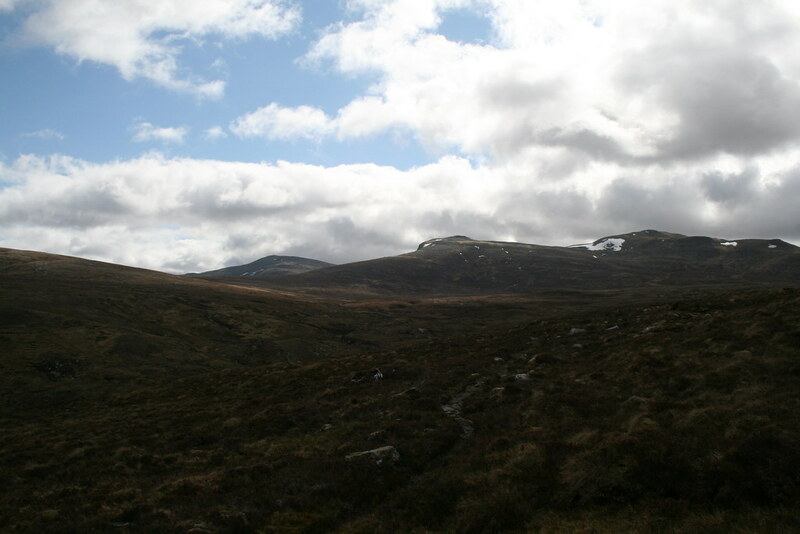 I followed the path for a couple of hundred metres to a slightly larger cairn and then went south west aiming for the streams to the east of point 872. 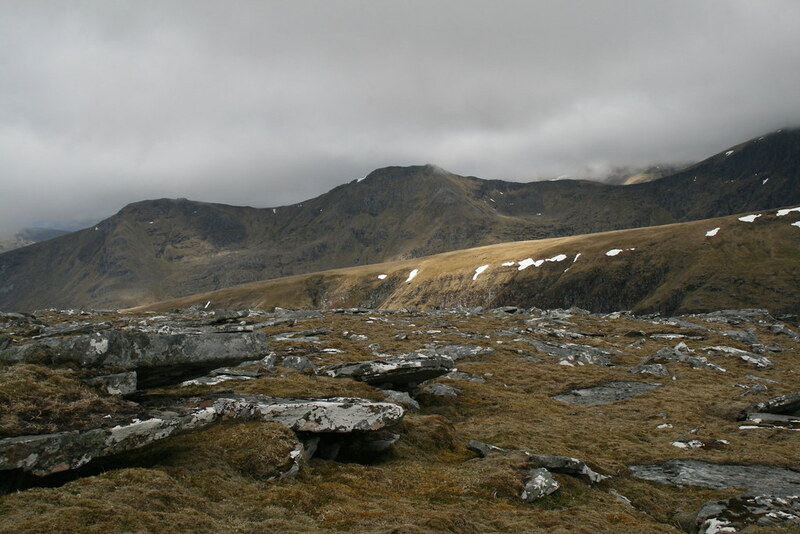 These would then lead me to the broad north ridge of Eididh nan Clach Geala. A large patch of snow several hundred metres long made the going a little easier. The weather was really becoming rather unpleasant now with the wind picking up too. The ground became rockier nearer the top. Voices were carried over on the wind – quite a lot of them by the sound of it. Near the top I could see a few people standing just below to the east of the rocky summit block. I went first to the cairn. It was just before 3pm – just under 2 hours from Seana Bhraigh. The group was well hidden there, sheltered from the worst effects of the wind and rain. I went down to say hello. It was a compleation group. I was offered some bubbly but I declined. I shook the compleater’s hand and congratulated him. I had a brief word with some of the remaining group (over 20 in number) and then was on my way. 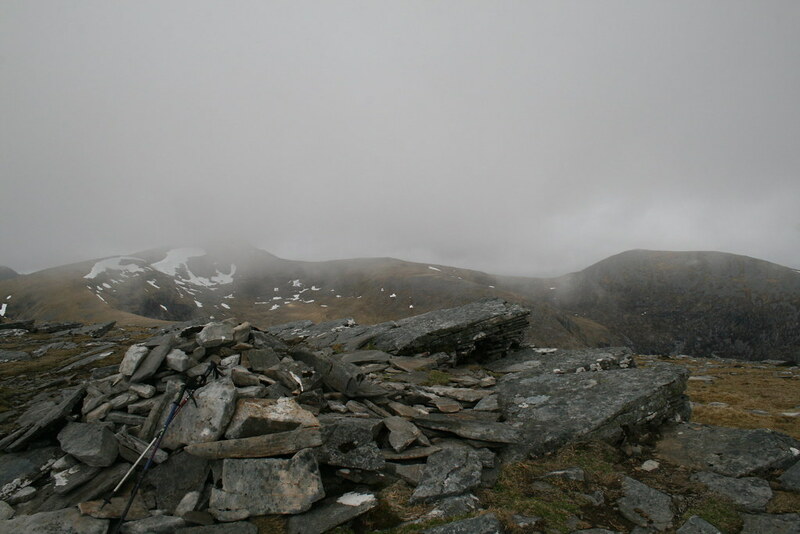 There is s second cairn 75m or so to the south east. I stopped and took a bearing before moving on. It was still wet and the wind remained boisterous. The group of three that I had met at the car park first thing came by and we compared notes – at least they had had Beinn Dearg clear. The path off Eididh nan Clach Geala disappears after a while. But the ground is grassy and easy. I dropped out of the cloud part way down. Some more lochs are at the col. I went perhaps a little further south east than was necessary and ended up by those lochs, but it meant that the way up was less rocky. 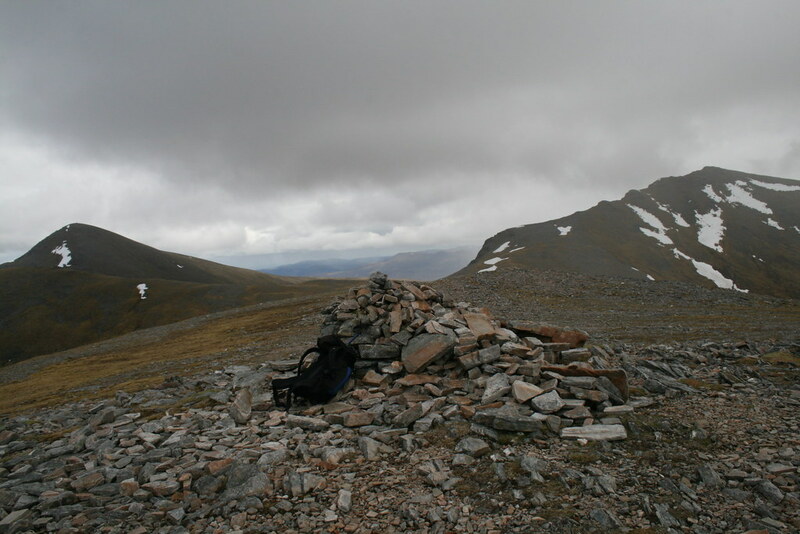 I emerged on the Cean Garbh plateau 300 metres or so to the east of the summit cairn. The ground here is extremely rocky, so there is no path. Although the rain had lessened, the wind remained strong. 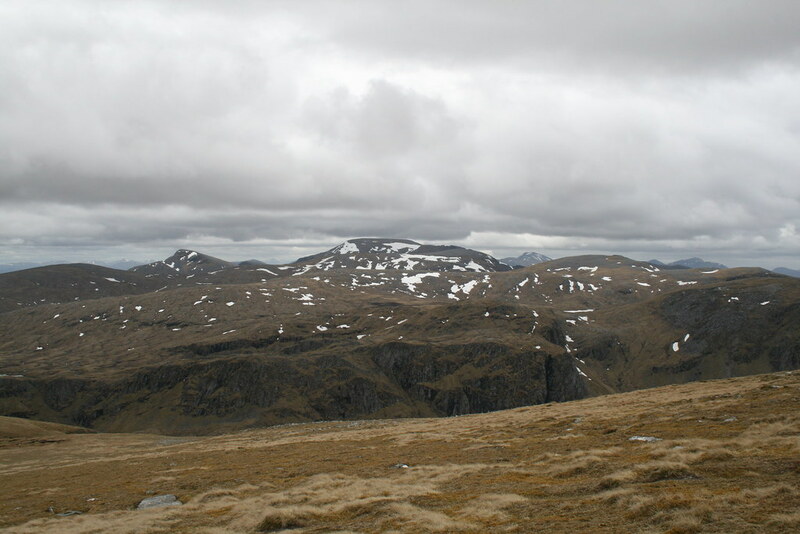 I continued on the main summit of Meall nan Ceapraichean. It was now 4.20pm. 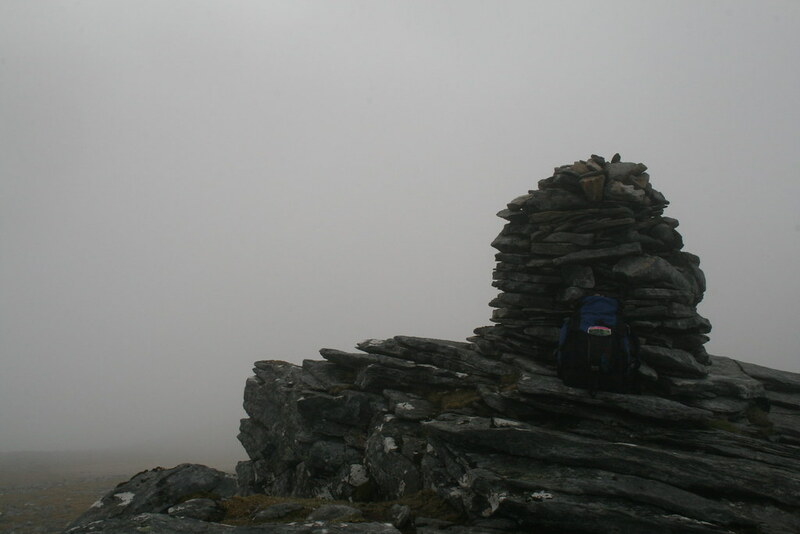 I took a picture of the summit cairn in the cloud and resigned myself to the 30% figure being right – a shame after the views from Seana Bhraigh. However, the next moment I looked around and the clouds had lifted! It was still quite chill and windy, leaden clouds were not too far above and remnants of cloud were zipping over the ridge just to the north, but I could now see Loch Broom reaching away beyond Ullapool. Beinn Dearg looked massive and near. I could see the distant point of Creag an Duine. I stayed 15 minutes or so before the chill and the wind drove me on. A path makes its way down through the rocky terrain towards the lochan spotted bealach where the path down Gleann na Sguaib is picked up. I passed a few heavily laden souls who were presumably going to stay the night near the lochans, but none seemed inclined to pass the time of day. In the early stages the path shifts from one side of the stream to the other. 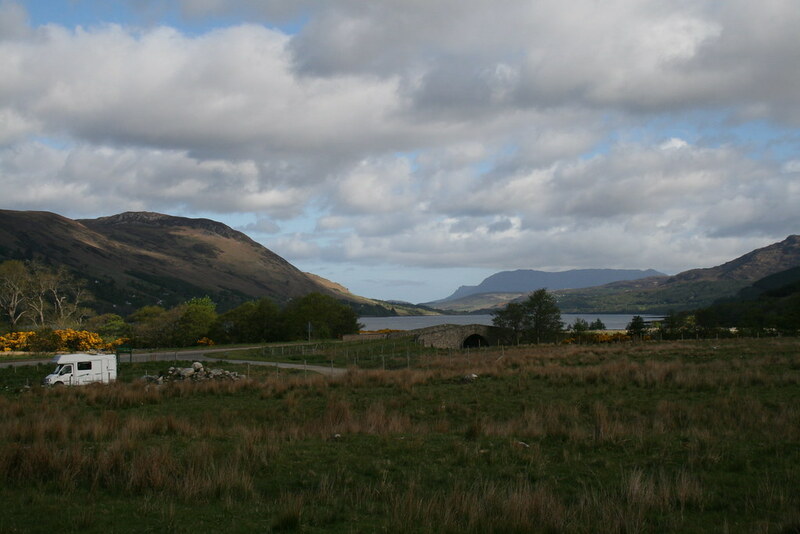 It is a lovely, if long, path with Loch Broom stretched out ahead. Camp sites aplenty can be found in its upper reaches too. Eventually I reached a short section of forestry before the outward route was met again. Here I met a couple with some bikes and a black lab. I suggested that they might lend me a bike for the final 3k. But I was told that the price was likely to be too high! So I did not persist with the request. The return to the car came quickly enough and I was back at 7.15pm just as the rain started again. Good timing!